As I’ve mentioned a few times on this blog, I had the pleasure/misfortune of growing up in Indiana, PA, hometown of Jimmy Stewart. Every year at Christmas, my little town in Pennsylvania pretty much claimed ownership of Christmas by declaring themselves not only “The Christmas Tree Capital of the World” (doubtful) but also, the real-life version of the town in the Frank Capra/Jimmy Stewart holiday film, It’s a Wonderful Life. Actually, it’s been said that Seneca Falls, NY was the real inspiration, but Jimmy Stewart was quoted as saying that the film’s set did remind him of Indiana, PA. That’s pretty much all the validation that the town needed to start selling gobs of It’s a Wonderful Life memorabilia in the local shops, and this blatant commercialization was all the validation I needed to boycott this movie for most of my childhood and adolescence. Was I wrong? Yes and no. After watching this film again, I still stand by my assertion that I wouldn’t have appreciated it as a child, but as an adult, it’s maybe my new favorite Christmas film. In the past, I always boiled down It’s a Wonderful Life (DVD/Download) into just that sappy scene at the end where little Zuzu (seriously, who names their kid Zuzu??) says in her annoying baby voice “Every time a bell rings, an angel gets its wings.” That scene is still too saccharine for my tastes, but the rest of the film plays like the best Twilight Zone episode you never saw. George Bailey (Jimmy Stewart) dreams of a life of travel and adventure, but is forced to put his dreams aside in order to take over his father’s Savings and Loan. He battles against the rich, money-grubbing Mr. Potter who wants nothing more than to make sure that he himself gets even richer while the poor get poorer. Sound familiar? (I wonder now why the Occupy Wall Street movement didn’t screen this as a propaganda film- a missed opportunity). When his bumbling uncle misplaces the day’s financial deposit, George is in danger of losing the business, going to jail, and losing his family. He contemplates suicide on Christmas Eve, but lucky for him, the angel-in-training Clarence comes down to earth to show him what it would have been like if he’d never been born. Realizing that he’s had an impact on everyone around him makes George see that he’s not the failure he thought he was, and he dashes home through the snow to his family. You may not look at It’s A Wonderful Life as a particularly boozy Christmas film, but it totally is. George Bailey drinks bourbon, gets into fights, and hangs out at the local watering hole Martini’s. 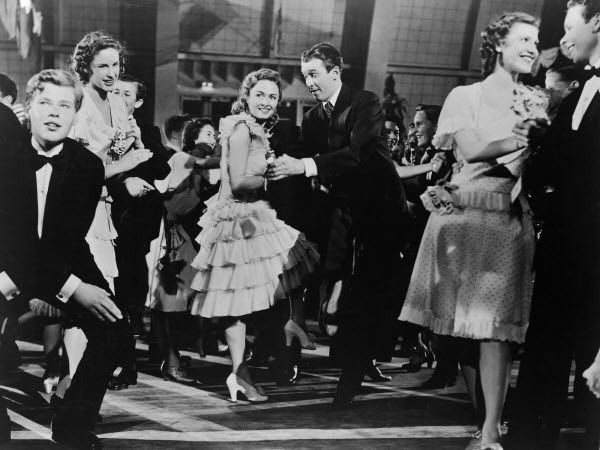 My favorite scene is early on when Jimmy Stewart and Donna Reed do the Charleston at the school dance as the dance floor splits open and they fall into the swimming pool below. They walk home, singing the tune that was playing, “Buffalo Gals”. It’s such a sweet scene, and as with everything else he was in, Jimmy Stewart plays it brilliantly. 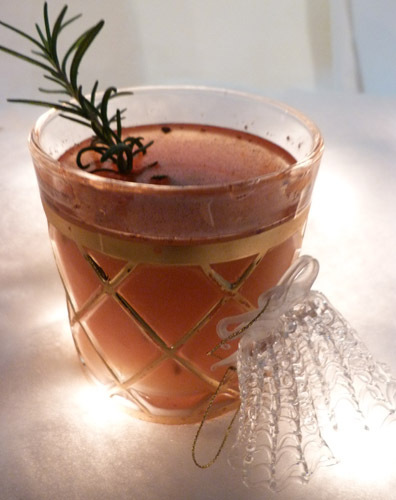 Before watching It’s a Wonderful Life, I recommend buying yourself a bottle of Buffalo Trace bourbon (it is my favorite brand after all) so that you can make this week’s cocktail, the Moon Lasso. Add apple cider and bourbon to a glass filled with ice. Sprinkle with Allspice and nutmeg, and garnish with rosemary. After revisiting this film again, I think it’s almost a shame that it gets limited to Christmas viewings. Christmas is such a small part of what it’s about. To me, it’s about appreciating your life just as it is, and if that means putting your youthful dreams aside, don’t worry- you’ll make new dreams. My life is a million miles away from where I thought it would be growing up in Indiana, PA. Not better or worse than I pictured, just unimaginably different. After all, I’ve suddenly fallen in love with It’s a Wonderful Life. Now who would have ever seen that coming? Cheers! Posted in Holiday Films and tagged Angel Clarence, Buffalo Trace Bourbon, Donna Reed, George Bailey Lassos the Moon, Indiana Pennsylvania, it's a wonderful life, Jimmy Stewart, Occupy Wall Street, Zuzu. Bookmark the permalink. Hi Julia, I’m glad you like this week’s cocktail! Of course you’re welcome to use the recipe in your newsletter, and a shout out to Cinema Sips with a link to the website would be great. Thanks for reading, and Happy Holidays! I have never seen this – thanks to your link and Josh’s badgering, we’re settling in to watch now!